Some see it as a bluff, or an attempt to cut a deal with Bing or some other search engine, others see it as the last gasps of a media mogul who just doesn’t get it and/or the desperate last throes of old media. 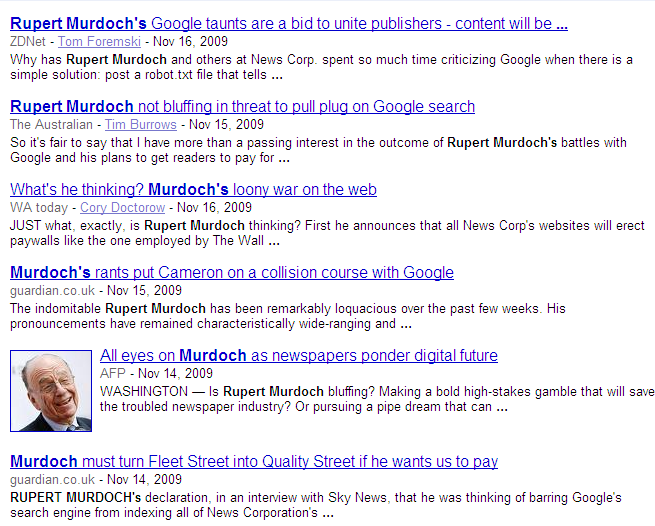 I heard that a year ago Rupert Murdoch had never done a Google search himself. That figures. I love newspapers but some of them aren’t doing a great job of convincing me that I care. I loved reading the NY Times when I was there recently and bought it every morning and I’ve got a lot of time for the AGE but then I go there this week and find vitriolic opinion columns from sensationalists like Catherine Deveny or across town the same stuff from Andrew Bolt in the Herald-Sun. 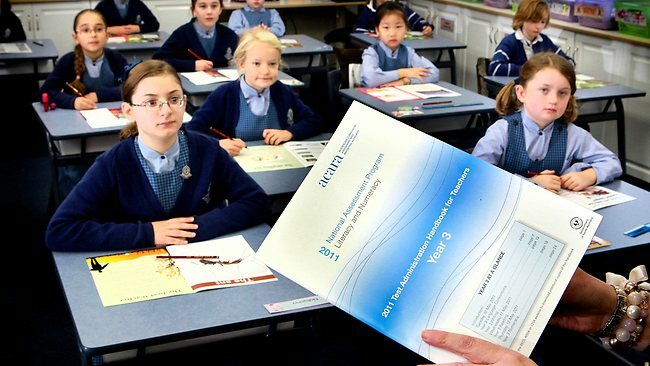 It’s fun for language analysis practice for Year 12s, but you dont’ go there for insight, or even particularly good writing. Can a newspaper that has to be one thing to all people really work any more? Truth is, when I wake up each morning I check my email and my Google Reader feeds before I check the newspaper online. I follow 101 blog feeds daily, from people who are expert in their fields, who I respect, many of whom also write better than Bolt, Deveny and the rest. Try Scott McLeod, Derek Wenmoth, Don Tapscott or David Warlick on education, for a start. I could go on! And I’m hopeful that a new era of open-ness has begun and that the genie is already out of the bottle in a democratisation of the media. We want access to the information that matters to us in exactly the format that works for us and I hope that Murdoch’s view of the world is fading. I’m teaching the classic text Frankenstein to my literature class next year and have been trawling around for resources. 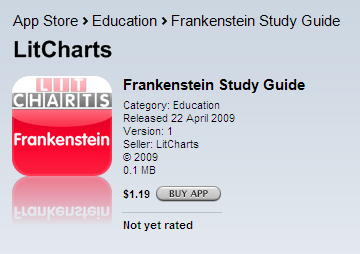 One that struck me was a study guide on the text available as a web site you could visit, a PDF you could download or an Iphone App you could buy for $1.19. You can find it on Itunes. It’s not anything particularly intuitive except that it understands the ubiquity around content now, and that we want choice in how we receive it. The ABC seems to understand, they’ve been working hard at delivering their content in increasingly diverse ways, including on hand held devices. I met with my publisher recently in planning a new text book for next year, maybe. We were talking about models of publishing and they’ve begun to move (slowly) toward a sort of print on demand model where you order a customised version of the book depending on the texts and contexts you’ve chosen to study. But what about making that same content available online? We’ve had a web site resource add-on for a while now, but I’m arguing for the book to be available in other ways too: to be read on the Kindle, downloaded and purchased in bits, even as an iphone app. It’s going to be interesting to see who catches us on quickest in all this; the slow ones aren’t likely to last.